On November 24th of 2005, a neighbor of mine, Don Gneiding, asked me if I would like to ride up to Southern Idaho with him to repair a memorial that he placed there a few years before. While we were traveling, I noticed a sign that pointed down a road proclaiming, 'City of Rocks'. Neither of us had ever been there, so when the work was finished on the memorial we decided to drive over for a look. 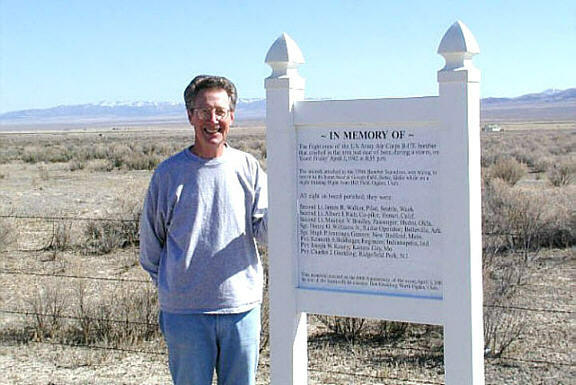 Don found that a cousin of his had died in a B-17 crash in Idaho, back in the year 1942 and he built a memorial plaque as a tribute to the men that died in the crash. See photo at botom. Another neighbor, Bill Graf, made a web page about the crash and Don's memorial tribute. Bill later donated the webpage to Utah Hikes after moving to another area. 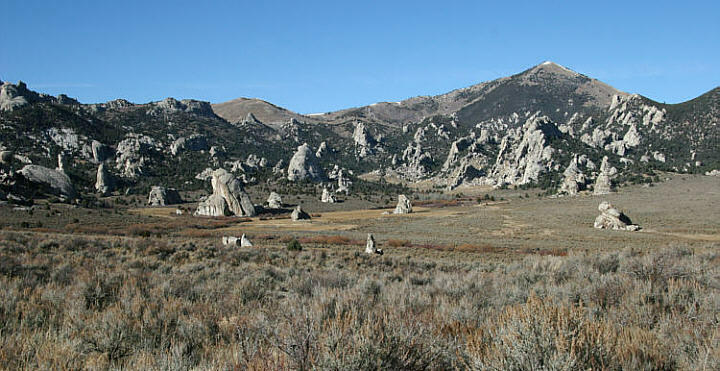 City of Rocks National Reserve is internationally known for technical rock climbing. City of Rocks is one of the finest granite-face-climbing sites anywhere. The towering spikes, monoliths and pillars of granite that rise out of this high desert are located in the Albion Mountain Range and is along side the old wagon trail to California's gold fields that was used in the 1800's. Rocks of up to 300 feet tall provide most of the climbing opportunities, and there are some 600 foot spires for real adventurers. Check at headquarters in Almo for climbing restrictions. It is not unheard of for European climbers to fly here, and American climbers have made it one of their favorite areas. To get to City of Rocks, take I-84 to Idaho exit 245 and drive west on Idaho route 77 through Malta, Elba, and Almo. Park headquarters is located in the town of Almo, which also has accommodations and a grocery store. Water is available at a pump station at the west end of the City and toilets are available at Bath Rock and Parking Lot Rock. Primitive camping is available. There are about 64 designated campsites in the reserve. Three group sites are available. There are two potable water sources in the reserve. Sites are equipped with picnic tables and fire rings. There are no hook-ups, showers or dump stations. Vault toilets are located throughout the reserve. Gathering of fire wood is prohibited. Bring your own wood or purchase at the visitor center. These photos were taken with my Canon EOS 20D, 8.2 Megapixel SLR Camera. The photos are set to lower resolution and compresed 10:1 for faster loading. You are welcome to look at or download any of the photos. If you use them on any other webpage, please give credit and refer back to me.